Today we would like to show you a showcase of Flash page flipping websites created on the basis of Flash CMS Templates from our collection. 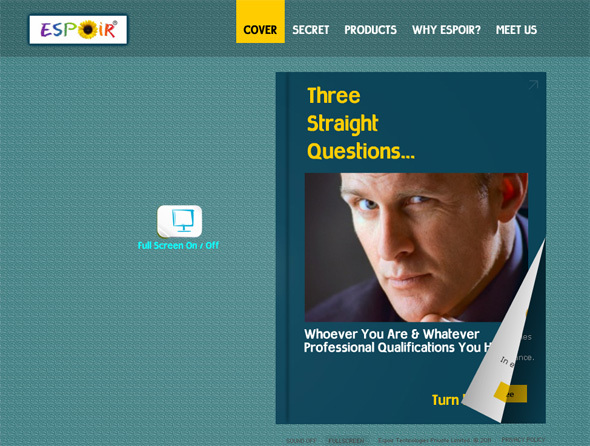 You will see some curious examples of Flash flip books with the CMS integrated. And what is the most interesting is that you can browse the original templates right away, after browsing the showcase. So, you are welcome to look through the customized examples of Flip Books with Flash CMS integrated — we hope the designs will inspire you to create your own Flash book with page flipping effect! The Flash CMS based website of the company that sells knowledge-based communication products and knowledge application simulators. The drop down menu of this Flash flip book allows to easily navigate the website; it is rather convenient and may contain as many sub-sections as the website owner wishes. The fullscreen mode is avaliable. 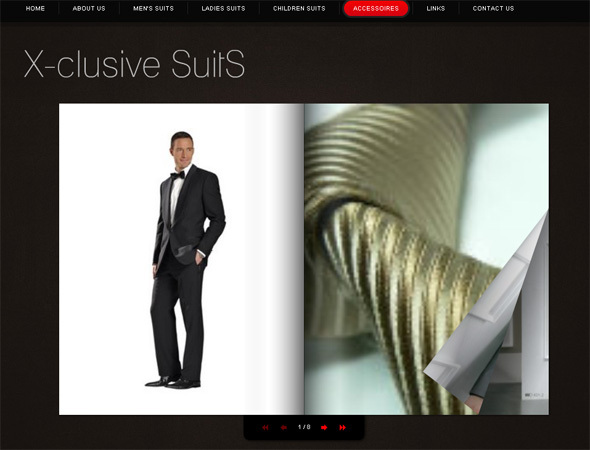 This attractive Flash website in the form of a flip book belongs to the company that sells suits and accessories. For each category of this e-shop a separate Flash flipping book is created. By the way, it is possible to create as many sections as necessary within the control panel. This is a really interesting customization of a Flash CMS template from our collection. The pages of the flip book can be navigated either by means of the drop down menu or by clicking on the page’s corner. 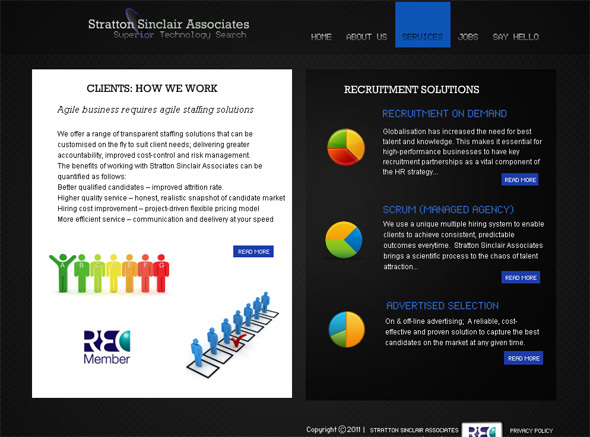 The website owner can change the background, change the flip book content, add elements and effects, and much more. 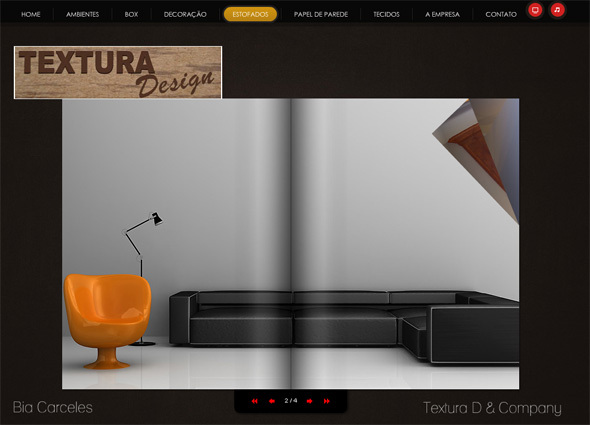 The Flash portfolio of the interior design company. For each menu category a separate flip book is created. In addition to the standard ways of turning over the digital pages, you can navigate the gallery with the arrow buttons below the book. 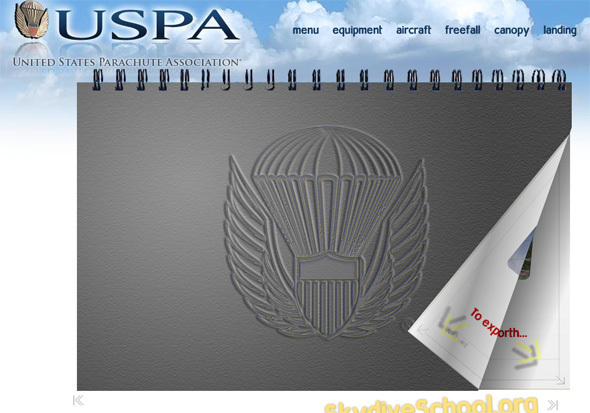 This digital book with page flipping effect belongs to the United States Parachute Association. The design is performed in the form of a notebook. In addition to the upper drop down menu, the designer added a bottom menu. By the way, the pages of the flip book can be filled with any content the owner wants: pictures, texts, etc. You are welcome to look through the original Flash Flip Book Templates, on the basis of which the above mentioned websites were created. All of the templates are complete Flash websites with Flash CMS integrated that can easily be customized via the control panel.